' This form of government [constitutional] does not invade the inner life of man.' Arima Tatsuo, The failure of freedom: a portrait of modern Japanese intellectuals. Language is a living system. If its productions (culture, memories and behaviors) are to endure, it cannot be in books or museum depositories alone, but entrusted to the living body itself, molded along the folds of time. 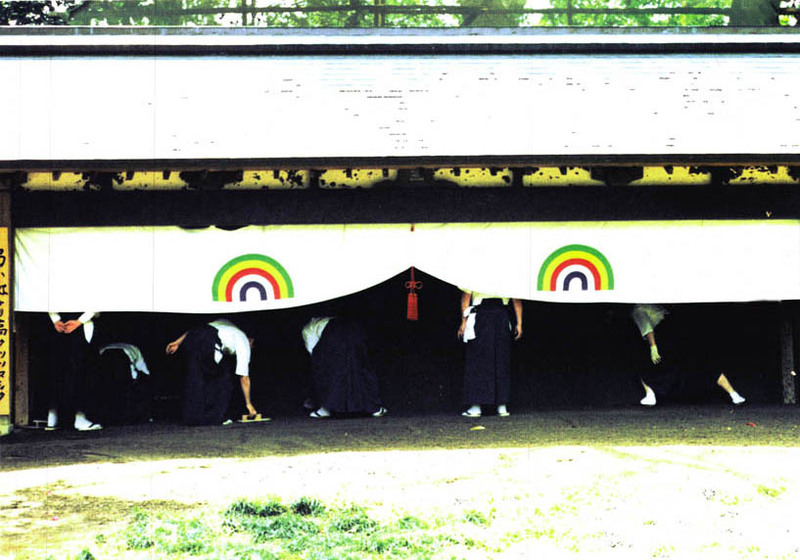 This essay examines the experience by first graders in a Japanese public elementary school of learning writing and reading, and puts it in regard with religious practices (rites and exorcisms) that are inextricably linked to language practices both as a record of their historical and political background as well as the ongoing demonstration of the potency of their effects, which perhaps includes the preservation of the emperor institution. The essay also endeavors to question the meaning of an aesthetic experience that participates in the general and quasi-instinctive obedience to all forms of authority. Pictorial votive offerings on wooden surface called ema where one writes ones wishes. 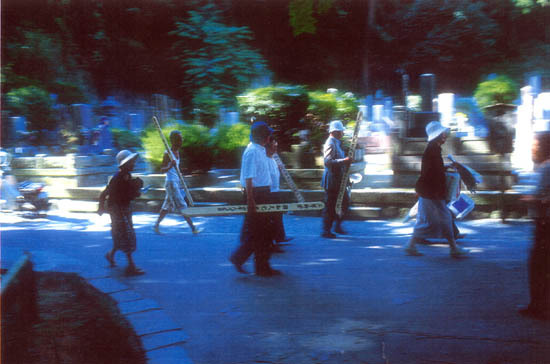 Family members bring wooden grave tablets called toba to the grave of their ancestors. 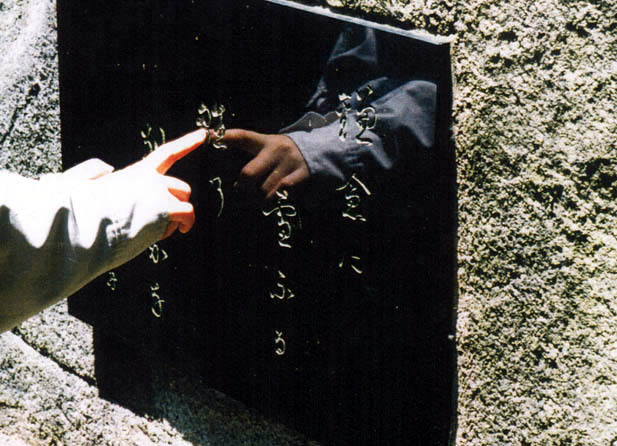 On one side is written a prayer (sutra), and on the other one the name of the person who makes the offering. So it is not surprising that a revolution in symbolism may be required (Whitehead again), and indeed twice in its history, in the 1880s and in 1946, Japan considered whether changing its writing system (or systems, since it is complex enough to require another one or two scripts to explain it) for the Roman alphabet might be a necessary step towards democratic institutions. Supporters and opponents of this radical reform became identified with clear political positions. In 1945, preparing to surrender, the Japanese government stated two priorities: save the emperor and preserve the Japanese language. Kamakura. A haiku by Suishyu (18th century): Snow over Kamakura, I have to leave my dolls. The finger is on the Chinese character for dolls. 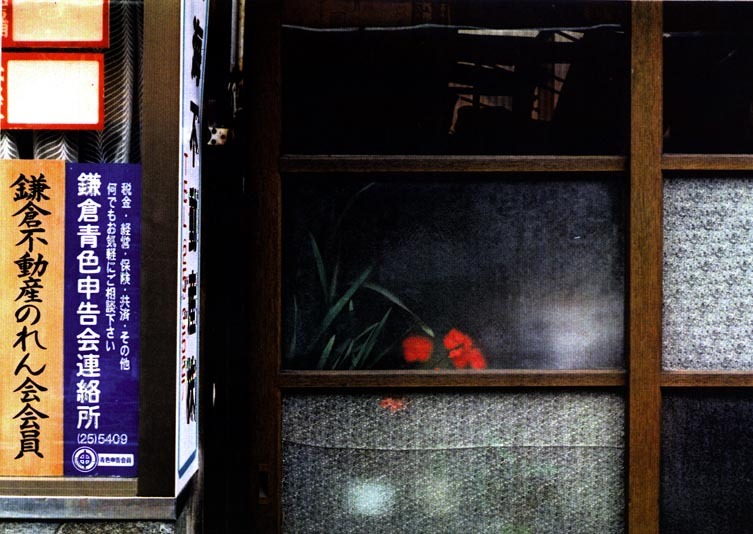 I lived in Japan between 1993 and 1999. On many occasions, I was able to observe the role that language, especially writing, plays in the maintenance of social behavior traits, and how it seems to succeed in conveying that two thousand-year-old values matter, that they still matter today, and that they matter in every area of life. I previously conducted in NY a study on the sound-shape of language that resulted in the production of a video with linguist André Martinet. I first heard of Japan (I was a high school student) in Eisenstein's remarks on non-linear storytelling: instead of 1,2,3,4, the story delineated in the Japanese scroll would run 1,3,2,4 allowing for a knot (a twist) along the way. 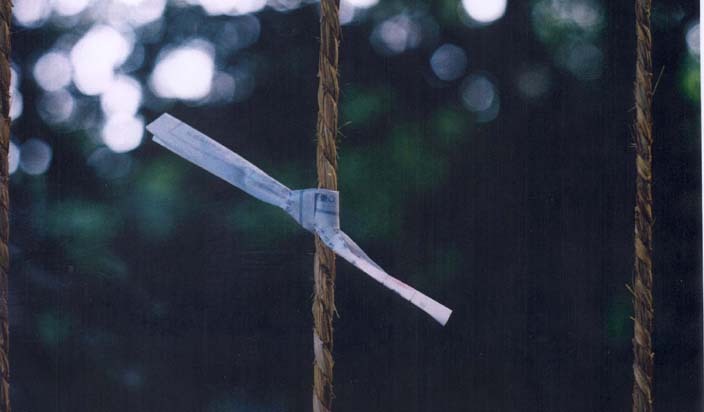 A fortune-paper called omikuji is tied to a string. 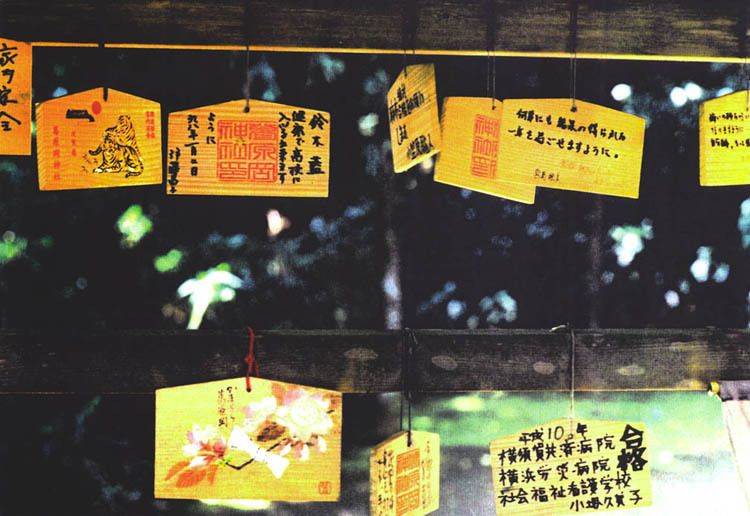 Omikuji is a popular form of divination available at shrines. If the fortune is not favorable the strip of paper is often tied to a nearby tree or frame set up within the shrine ground to dispel the prediction and avoid bad luck. One can observe today in Japan patterns of feudalism and a clan mentality. The Japanese are entangled in networks of obligations and duties that at times considerably restrict the exercise of personal judgment and the sense of responsability it entails; consequently, the group dynamics at every level of society allows changes only reluctantly and thus at a great cost, after lengthy deliberation, and often with the help of outside, or foreign, pressure (gaiatsu). A recruiting poster from an extreme-right organization. 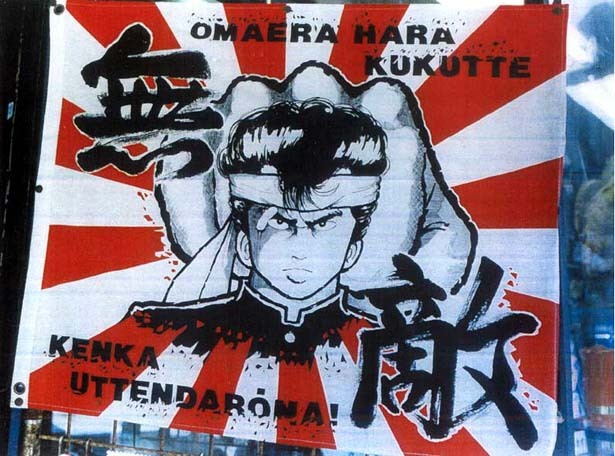 The romaji phrases read: prepare yourself for the worst!, and pick up a fight with somebody!; the chinese characters mean unbeaten. After looking at calligraphy, I realized that I needed to understand how this art (or religion, really) of writing begins and grows in the individual. I decided to see how young Japanese school children learn writing in their native language which the Japanese call koku.go (literally, the national language) in contrast to nihon.go (the Japanese language) used to refer to the language when spoken to and by foreigners. Book with samples of fabric for kimono, 1915. With the help of a fellowship from the Canon Foundation in 1996, I was able to observe for an entire school year the Japanese lessons of a class of first-graders. I often videotaped the classes, and systematically kept documention of the exercise sheets and other materials written and/or drawn during the classes. I also guided the children through their first steps into my language. This experience presented me with many fortunate encounters, gifts all, many of which haven't been opened yet. 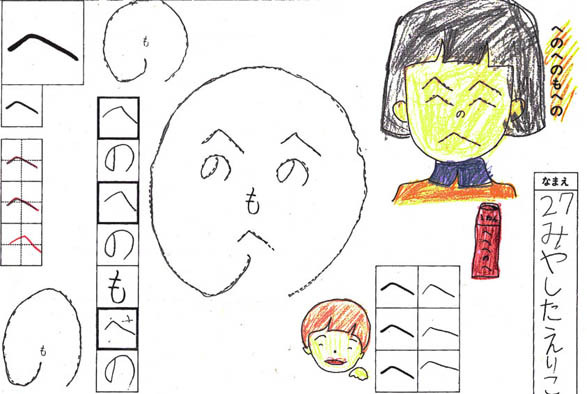 The exercice sheet of a student composing (writing/drawing) of a face with letters from the hiragana syllabary. What was most striking for me in these Japanese lessons was the discipline of the hand (indoctrination, one could say), and particularly how this self-control develops with the grid that functions as a casing of the eye, keeping in mind that eye here (at this age of life) means much more than the eye, for reading and writing represent the most elaborate dialogue, mediated by the hand and the voice, between the brain and the outside world. April 15, 1997, elementary school in Yokosuka, first grade class. Two weeks into school (which in Japan begins April 1st.) the children are learning how to write their first letter, the hiragana for the sound [a], and which is made of three strokes. In the photograph the teacher is writing the second stroke of the letter. I came to understand that whereas Western societies are structured around the law (normative essence) internalized by the members of the community, Japanese society is structured around codes of manners and forms (kata), that are pure exteriority (visibility); it is a society, then, that understands morality (traditions and virtue) as corporeal information (Kafkas The Penal Colony provides a literal rendition of a writing of the law onto the surface of the body). It is a society where the person is exquisitely and tightly wrapped, most famously in the kimono, and in many other enclosures, the most pervasive one being language as it governs the developmental growth of the child and directs behavioral transactions from individual to individual which, in the end, given enough time and practice, constitute and validate a tradition. 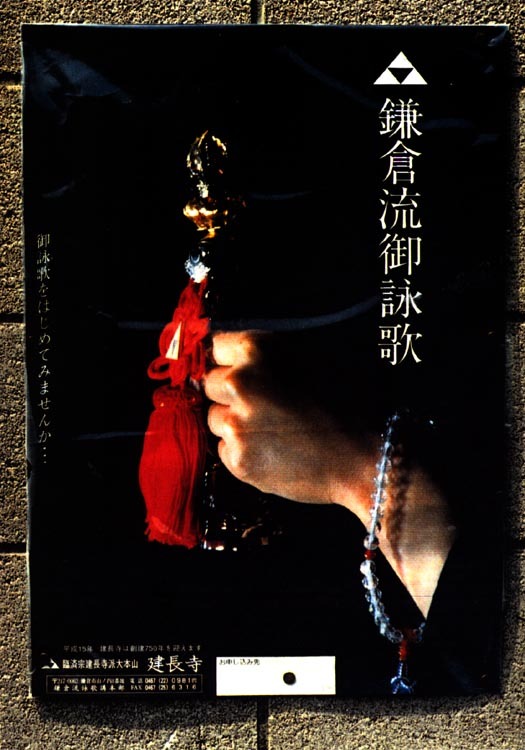 An exorcism to oust evil spirits from the newly bought car is going to be performed by a Shinto priest. 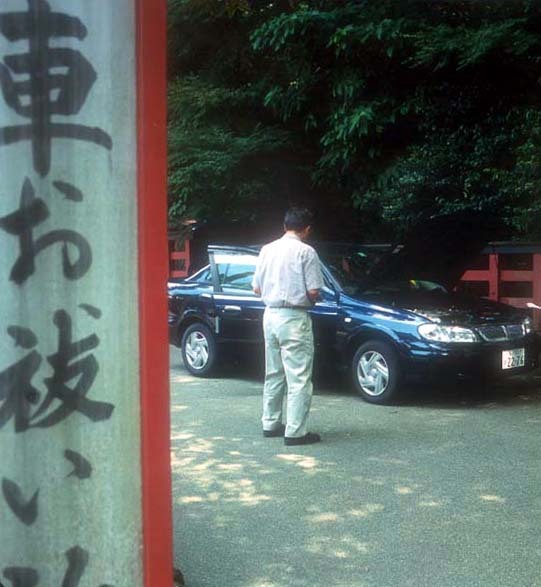 The sign reads: Ceremony of the great purification for cars (kuruma oharai jyo). The other pivotal role writing plays in Japan is in the religious sphere. From the very beginning writing came to Japan together with Buddhism from China by way of Korea (called at the time Paekche). 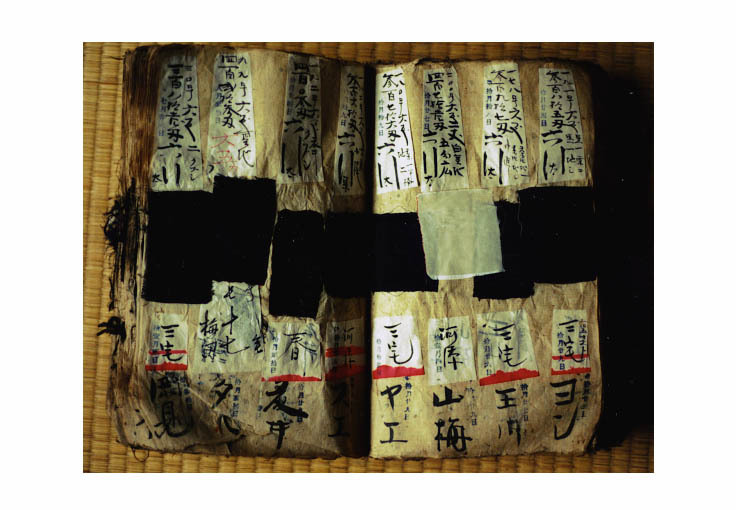 The rites and ceremonies incorporating writing are numerous, both in Shintoism and Buddhism, and writing itself came to take on a sacred significance. It is a delicate matter for a foreigner to intervene in a other country's internal affairs, and in Japan even more so. It is known that Japanese are not always comfortable with foreigners who speak their language; they prefer the buffer of a translation. Securing permission for access in an elementary school took a full year. 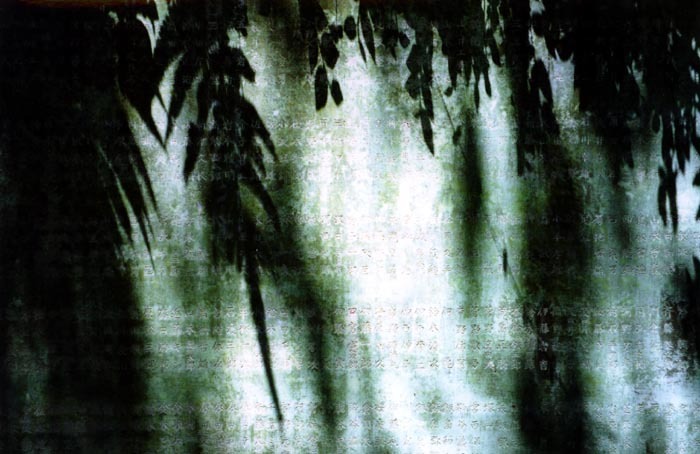 Japan has produced some of the fastest cuts in the history of cinema, while concurrently evolving elaborate figures of slowness in art as well as politics (literally, when, for instance, politicians would express their dissatisfaction by walking to a parliamentary vote extremely slowly, a pace called the step of the cow). 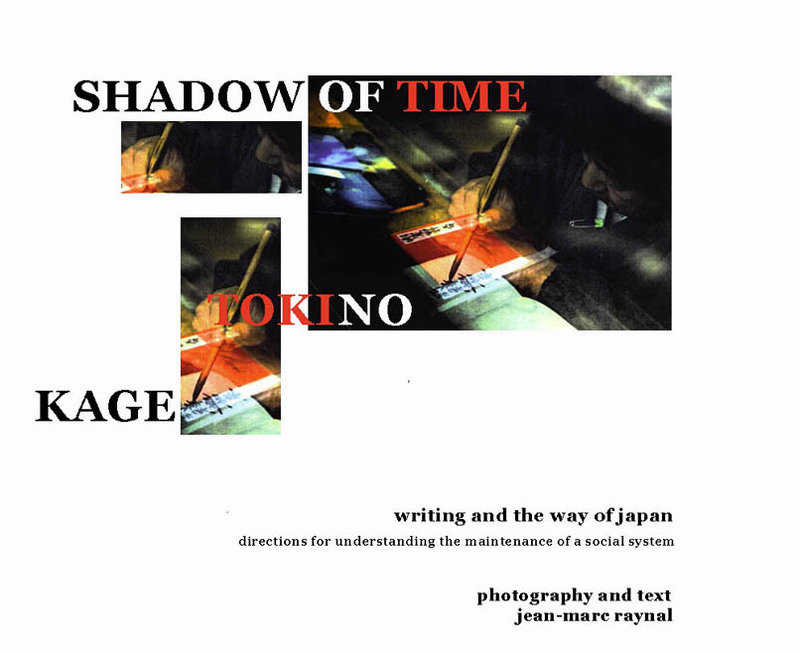 The research for this essay originated in the desire to understand how human beings use their eyes and their hands, and, specifically regarding the Japanese tradition, the cultural implications of graphic symbolization. I have two passions: language and picture taking, still or motion. I see language as a mirror (interface) between nature and nurture; studying it and teaching it allowed me to understand better how nature develops and reclaims itself in cultural configurations. I use pictures to study how forms, shapes, and structures establish relationships between the body, the image, and time. a large rock witnesses the passing seasons..."
This project was supported by a fellowship from THE CANON FOUNDATION EUROPA. I wish to express my gratitude to Hiroko TAMURA and all her pupils at the elementary school of Johoku shagakko in Yokosuka. I am also deeply indebted to Margrit KELLER-NATORI, Mariko TAMAGAWA, Toru OTA, Madoka KAGA, Ikuhiko HIGE, Chikako KAWAHARA, Koun SUHARA, Yohji HAIJIMA, Teruo INOUE, Kohei OKAMOTO.